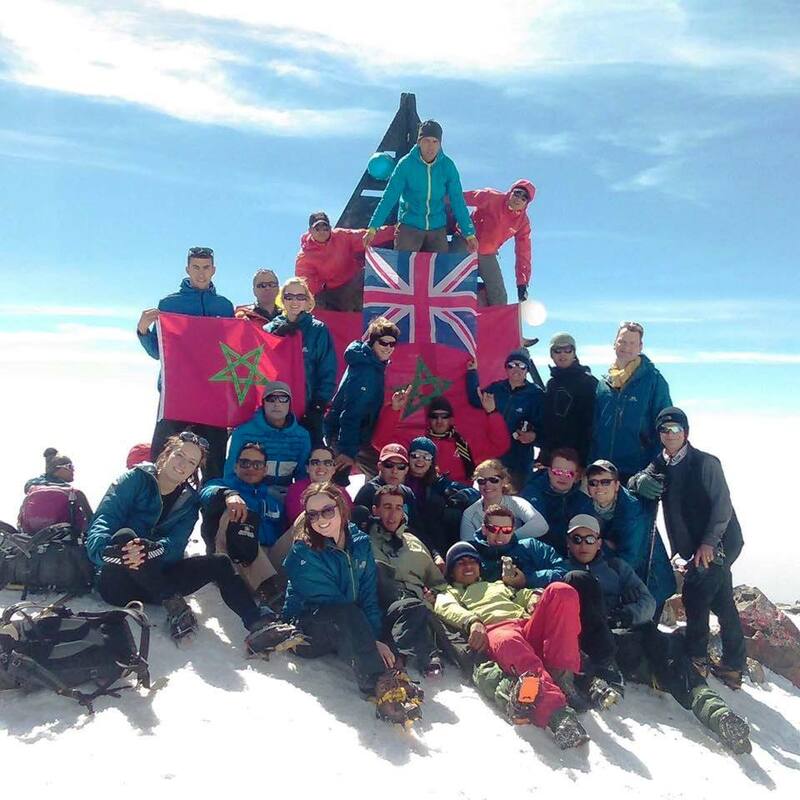 On the 22nd March 2017, Cambridge University Officers’ Training Corps (CUOTC) departed for a trekking expedition in the High Atlas Mountains, Morocco. 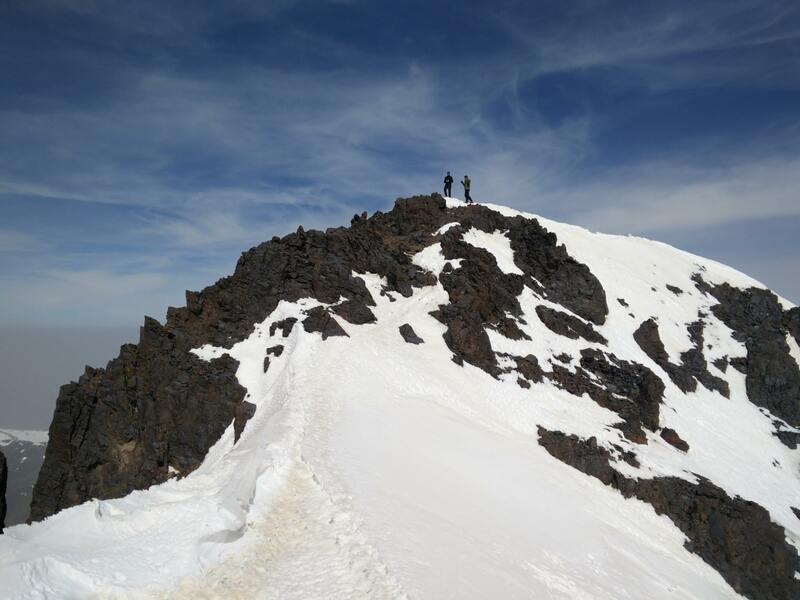 The aim was to summit Jbel Toubkal, the highest peak in North Africa. Our secondary aims included empowering officer cadets (OCdts) to embrace leadership roles and to give potential officers a taste of adventurous training and leadership in the Army Reserves. 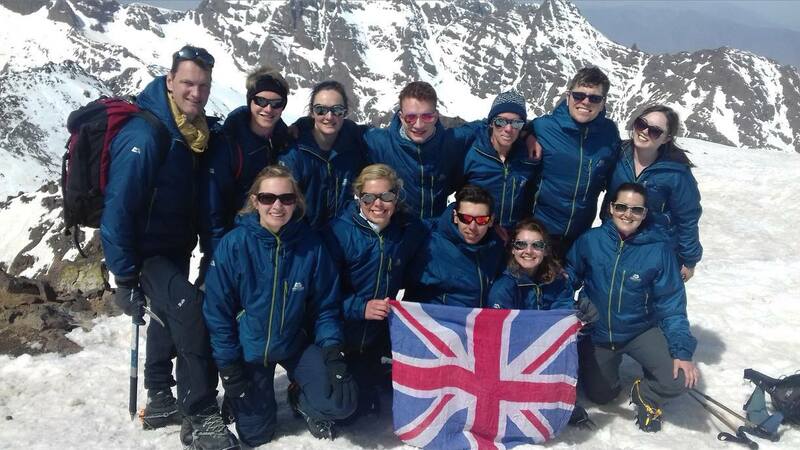 Furthermore, we hoped members of the expedition would return to the unit enthused about mountaineering and the fantastic opportunities available at CUOTC. The expedition was planned and executed by JUO Gibbons, an officer cadet at CUOTC and a final year PhD student at Anglia Ruskin University. It was made possible by funding from The Ulysses Trust and with the help of two Winter Mountain Leaders from 3 R WELSH and RAF Air Cadets. 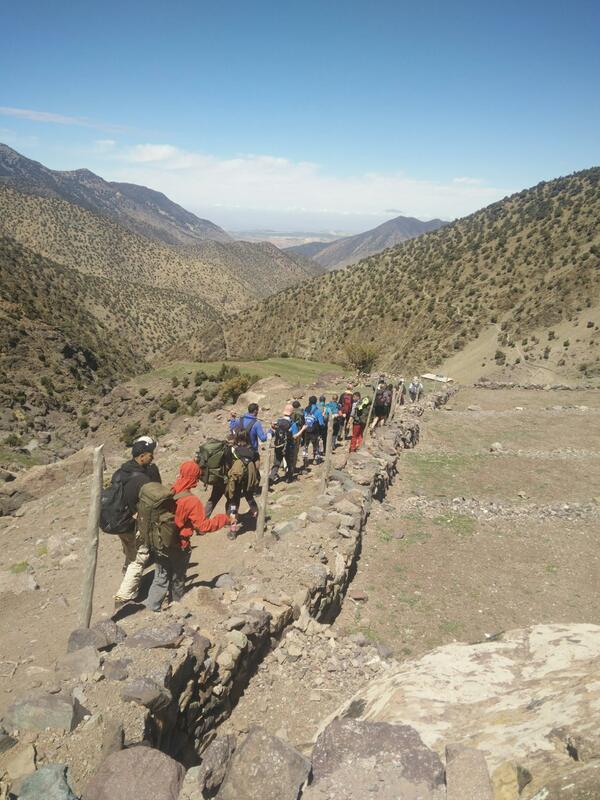 The remainder of our group consisted of eleven OCdts and the Commanding Officer of CUOTC, accompanied in Morocco by eight from the Moroccan Army and four from the Gendarmerie. 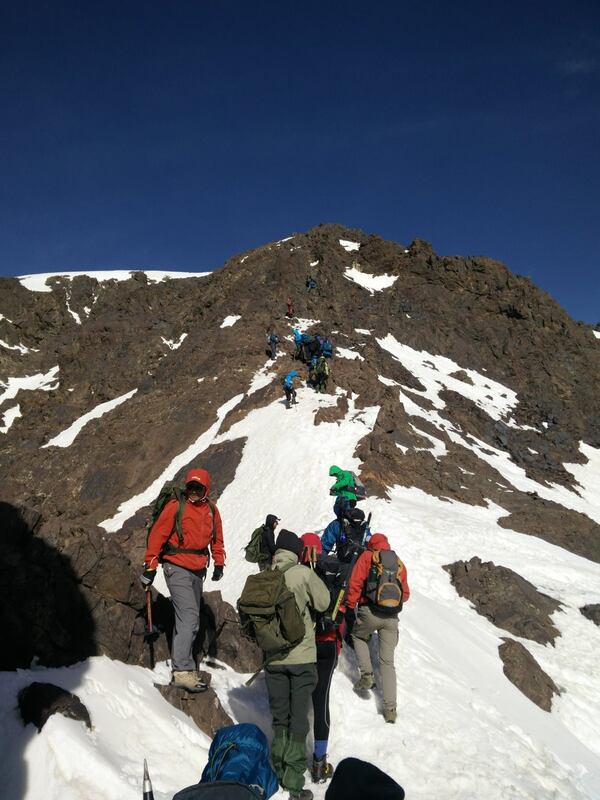 The expedition exceeded expectations on every level with the group summiting not only the highest peak in North Africa, but, the three highest peaks. It enthused many in the group to develop more extravagant mountaineering aspirations and will hopefully lead to the attainment of adventurous training qualifications. 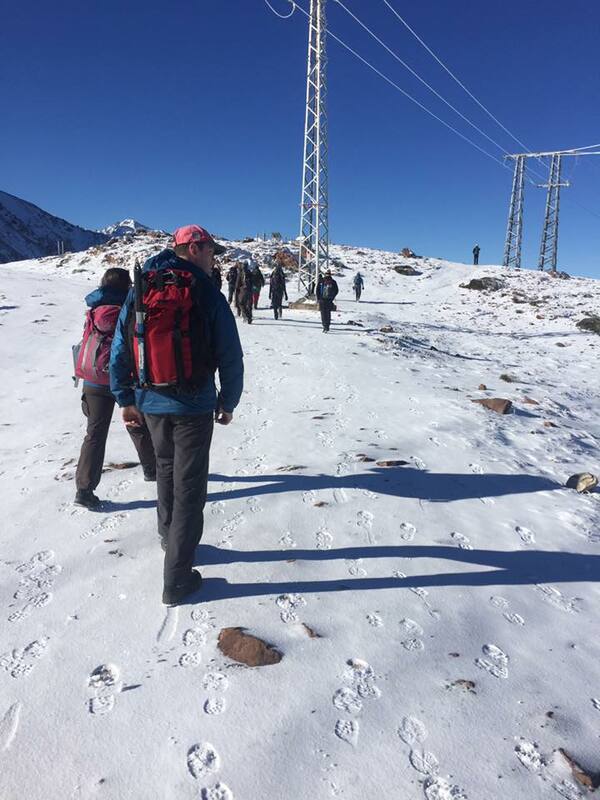 Following our return, the unit has been buzzing with talk of organising the next big trekking expedition with many OCdts stepping up to the plate with ideas. Our journey started slowly with a delayed flight from Gatwick. Once on the plane, the pilot informed us that the electronics were not working, but, ‘not to worry; a plane is very much like a computer, we’ll turn it off and back on again. That should do the trick’. Five minutes later we were informed that it hadn’t done the trick and that an engineer was on his way. Eventually, much to our relief, we boarded a new plane bound for Marrakech. 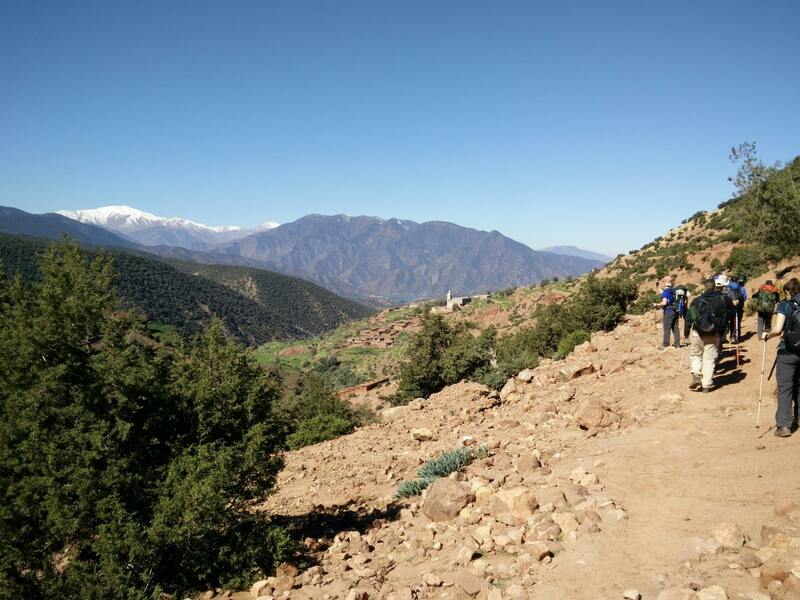 From there we travelled south to the bustling village of Imlil for our first night in the Atlas Mountains. Upon our arrival, we were greeted like old friends by a swarm of Moroccans before being whisked off for lunch on a sun-soaked roof terrace with a panoramic view. After our wonderful introduction to Berber cuisine, we walked around Imlil, absorbing the culture and preparing for a birthday party on the evening to follow. On our first morning, many were woken before sunrise by the adhan (call to prayer) emanating from the minaret of the local mosque whilst others were too exhausted to stir. 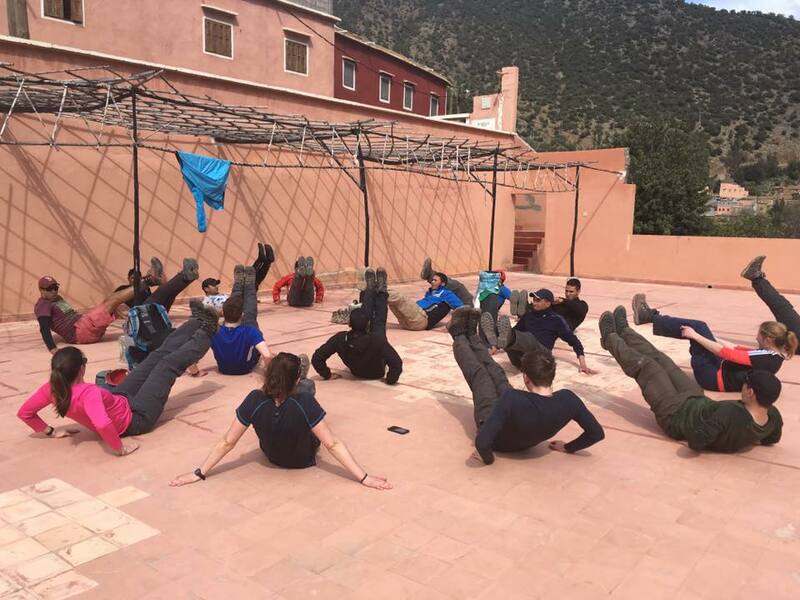 After a breakfast of all-you-can-eat bread, porridge and spreads, we met with the group of twelve Moroccan Armed Forces that would be accompanying us on the trek. It was a long day, the most arduous of the trek, covering 21.4 km with 1490m of ascent. However, the day whizzed by chatting to our Moroccan counterparts, who fortunately had a good grasp of English and French. We had two OCdts studying Arabic at university in our group, but, it conspires that Moroccan Arabic is so vastly different to the Egyptian Arabic taught, that it was of little use. Upon arrival in Oukaimeden, everyone was rather quiet until hot drinks and biscuits were produced. It was bitterly cold with little to do, however, everyone perked up for dinner, especially when balloons and a birthday cake emerged to an inharmonious chorus of ‘Happy Birthday’. We were then subjected to a full-blown disco with lights and screaming children whilst trying to sleep as the refuge was hosting a huge party for school children that night. This would be the first of two birthday celebrations in Morocco. The next few days flew by, walking high and sleeping low in order to acclimatise. The days were full of breath-taking scenery interspersed with river crossings, quaint villages and breaks to nibble on sugared nuts or the Moroccan version of trail mix. The evenings were spent drinking copious amounts of mint tea (otherwise known as Berber whisky), playing cards and chatting with our counterparts. One night after dinner, we heard a commotion coming from the next room. Upon investigating, we found that the Moroccans were all huddled in front of a TV ready to watch the football – Morocco Vs. Burkina Faso. Naturally, we all piled in. Halfway through the match food arrived and they were adamant we eat with them, so we tucked in to the most delicious tagine of the trek, jumping up periodically to celebrate. Morocco won 2 – 0, which was a great source of bonding. 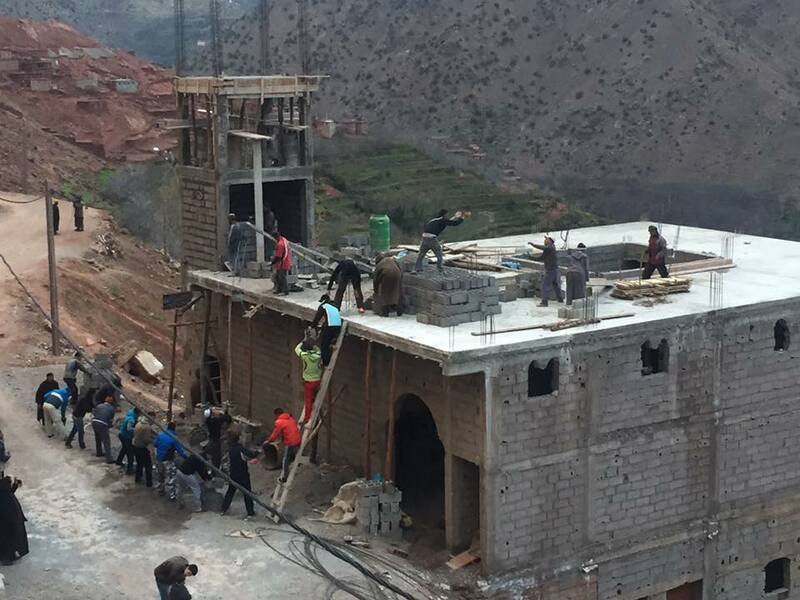 Another evening we watched as the Moroccans, after a long day of trekking, helped to build a village mosque. 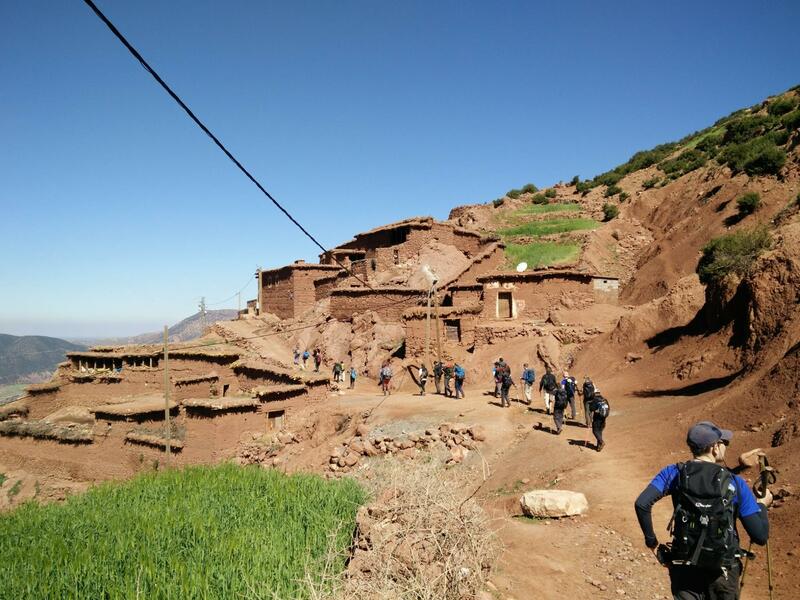 Unfortunately, our risk assessment didn’t cover such activities, however, it was fantastic to see the Berber community spirit; a community spirit that was evident throughout the whole trek. One day it manifested in the Moroccan group spending an hour clearing two large boulders from the middle of the road, another day it appeared when everyone chipped in to repair a road whilst on the way to play a football match against a local team, and yet again when we arrived at the gite before our climb up to the Toubkal Refuge to find two goat carcasses for dinner. But, the warmth of the Berber people extended beyond the group we were walking with. We were relaxing at a gite one evening when we were told that the villagers had heard of our presence and wanted to celebrate. That night, the men of the village came to the gite with their bendirs (a type of Berber drum) and played traditional Berber folk music with chanting and dancing. It was a brilliant insight into a very different culture. 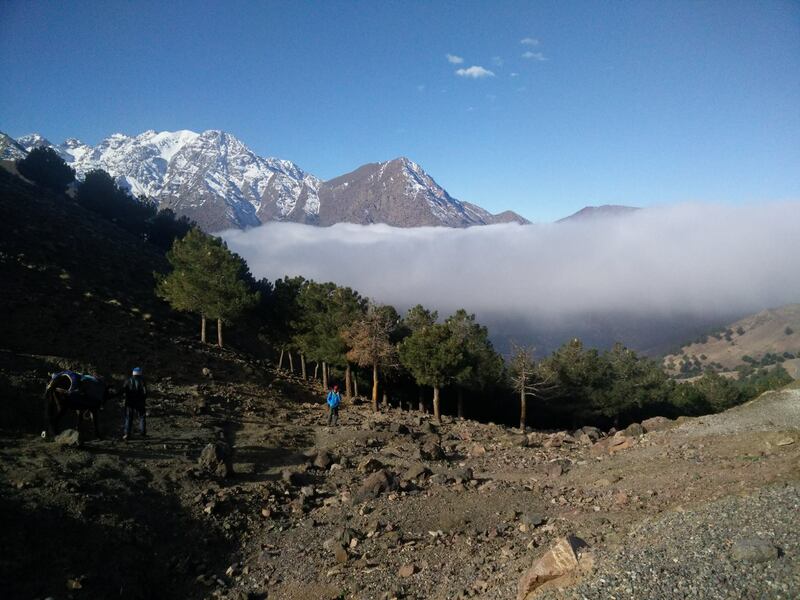 After 7 days of trekking, we arrived at the Toubkal Refuge. Everyone was apprehensive for the next morning, the summit of Jbel Toubkal (4167 m). We spent the afternoon practicing with ice axes and crampons, and crowded around the log burning stove to battle the cold outside. We started early the next morning, much to the disgust of the group, however, the weather was perfect and everyone soon perked up as we snaked our way up the highest peak in North Africa. The sky was quite clear at the summit, which added to the occasion. There was celebration in the air whilst people ran around with cameras trying to capture every moment of the achievement. Talk soon turned to the route for the following day with many in the group gunning for the second and third highest peaks in North Africa. Before long, we said goodbye to the summit and zigzagged our way back down the mountain, passing an accident near the bottom. The Moroccan Armed Forces, whose unit deals with mountain rescues, ran off to help the woman whilst we continued to the refuge. A couple of hours later the Moroccan sergeants surprised the group with traditional pancakes as a reward for reaching the top. The night brought with it even more celebration in the form of birthday party number two. After dinner, the Moroccans ran in throwing balloons, blowing bubbles and carrying a birthday cake. The party commenced with music and laughter as people tried pinning the tail on the donkey. Everyone was especially keen to spin the Moroccan Captain for his turn. We awoke slightly earlier the next morning. Everyone was fired up to bag the next two highest peaks in North Africa, Timzguida (4089 m) and Ras Ouanoukrim (4083 m). The donning of crampons was quick and in no time at all we were half way up Ouanoukrim. Everyone was thoroughly enjoying the climb until we rounded a corner and were met with a gnarly looking scramble. It was slow going and members of the group fell into one of two camps, exhilarated or bricking it. 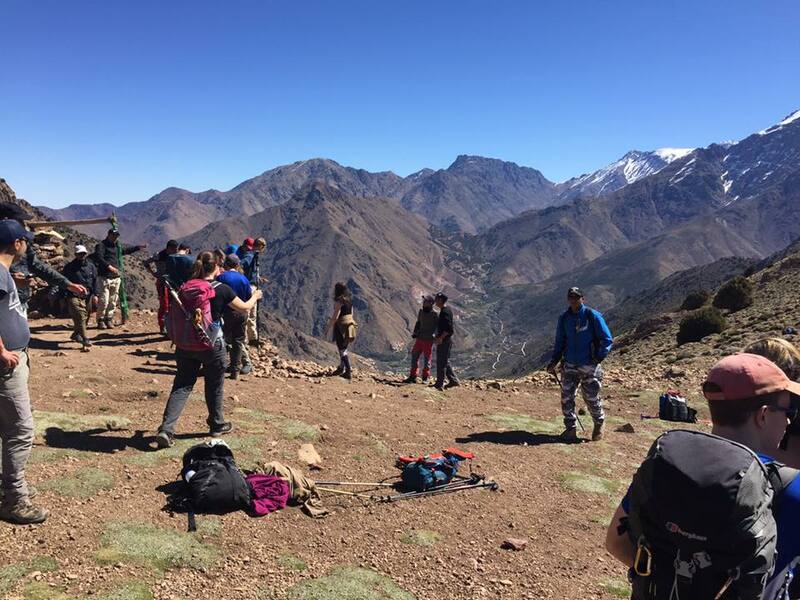 Eventually, with the scramble over, it was plain sailing to the top of Ras Ouanoukrim, where we agreed the views were even more magnificent than those from Jbel Toubkal the previous day. With newly restored fire in our bellies we pushed on to the summit of Timzguida and made a quick descent down to the refuge via a different, but, equally challenging route. Back at the refuge, after a quick pit stop for lunch, we all decided that there was enough energy in the tank to continue our trek back down to the ‘luxury’ of Aroumd. It was a long day totalling 17 km with an ascent of approximately 1000 m and a descent of almost 2400 m, yet fatigue was mixed with jubilation at having summited the three highest peaks in North Africa. The next day we ambled down to Imlil, where we organised our kit, bought souvenirs and gave our feet a well-deserved rest. Later, our Moroccan counterparts threw a party for us. We exchanged gifts, praise and contact details over mint tea and biscuits, and then ended our time in the mountains with dancing and farewells. The following morning we travelled north to Marrakech for a whirlwind of culture. Some crammed as many sights into our short stay as possible whilst others soaked up the hustle and bustle of the city, although we were all united in scouring the endless souks and bartering for as many items as our luggage would allow. CUOTC would like to extend a special thank you to the Ulysses Trust, as without their donation this truly memorable expedition may not have been possible.